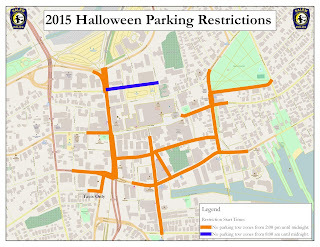 The Salem Police Department's Traffic Division announce the following road closures and parking restrictions for Halloween Night (October 31, 2015). 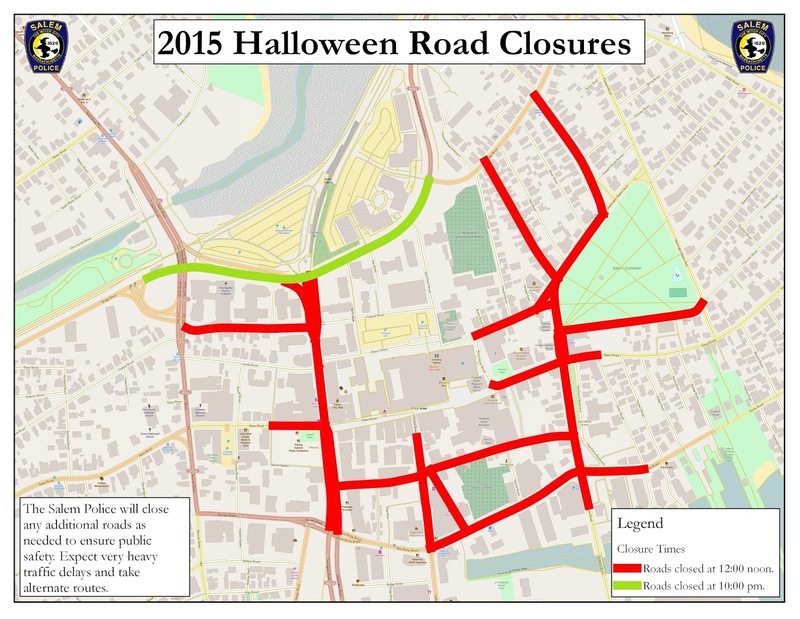 Visitors are encouraged to review these road closures and pick alternate routes when coming to the city. Expect heavy traffic throughout the weekend, specifically along Routes 128 and 114 coming into Salem. The following roads will be closed to traffic as of 12:00 noon time (or earlier if needed). Bridge Street will be closed between the ramps to North Street and the Bypass Road at 10:00 pm and remain closed throughout the fireworks. 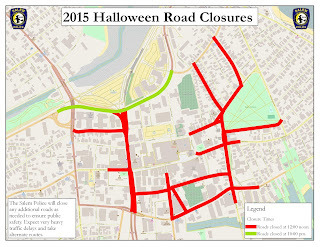 Note: Brown Street and Washington Square North have remained open in previous years, however may be closed if needed. Note: The Lafayette Street and New Derby Street intersection have remained open in past years, however may be closed if needed. 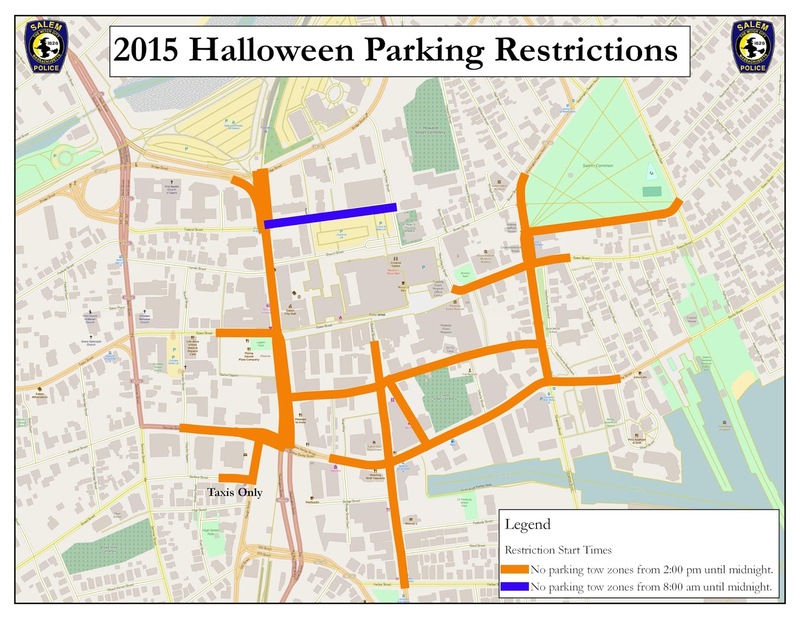 The following areas will be posted as "No Parking - Tow Zones" from 2:00 pm through 12:00 am. Lafayette Street both sides from Harbor Street to Front Street. Public parking lot along Front Street. Public parking spaces located on Central St in front of old police station. Essex Street from Barton Sq. to Union Street. Both sides. Derby St both sides between Union Street and Lafayette St.
Washington Street from New Derby to Bridge Street both sides. Washington Sq. South and West both sides. Norman Street from Washington Street to Crombie Street. New Derby St between Klop Alley and Lafayette Street. Margin Street and Gedney Street along post office. Taxi’s only. Federal Street both sides between Washington Street and the District Court. No parking tow zone from 8am to 2400. From downtown leave using Lafayette Street southbound, Canal Street southbound to Rt. 1A south to Lynn and Swampscott and points south. From downtown leave using Margin Street, Mill Street or Washington Street to Jefferson Avenue to Wilson Street or Jackson Street to Rt. 107 South or North. Jackson Street to Essex Street to Boston Street into Peabody and Rt. 128 North and South. 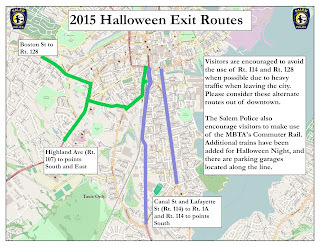 The Salem Police encourage the use of the MBTA's commuter rail when visiting the city. The MBTA has added extra trains Halloween night. There are parking garages along the line, and access to the subway system. See this page for more details about using the Commuter Rail. The Salem Police will close any additional street, or make changes to the above plan, without notice to ensure public safety. 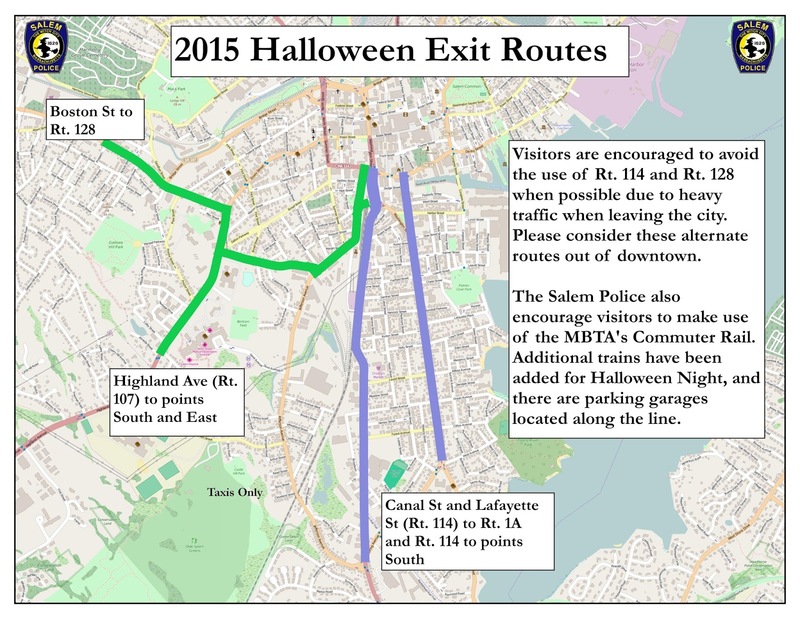 Please use extra caution when traveling to Salem due to pedestrian traffic. Make sure to follow us on Facebook and Twitter where we will be posting live updates about traffic concerns.